Somma Air beds. feature unique patented dual, horizontally baffled air chambers. These specially designed air chambers provide a comforting cushion of support that is easily adjusted for your desired firmness, assuring a near perfect sleep posture with any firmness you choose. Somma air beds" Smart and Quiet" Air Pump, comes with two separate controls to allow partners to adjust each side of the bed to their comfort level. This sleek, stylish, innovative high profile, Somma Aire Euro Style Pillowtop Sleep System features superior craftsmanship and design. Three inches of silky angel hair, quilted tack-and-jump style to our exclusive all-way stretch backing, moves with your body as you sleep, maintaining fresh air circulation and a comfort unlike any other. A 14'' high loft, flexible, and impression resistant contouring surface hugs the natural curves of the body. Body sensitive visco elastic memory foam cradles the natural curves of your body while providing the correct Stand-Tall Sleep-Tall posture. Achieve maximum comfort with pressure-reducing Ultraluxe, a revolutionary premium grade foam that creates a smooth, resilient feel. Ultraluxe highly advanced engineering achieves maximum comfort through pressure reduction. Enjoy personalized comfort and support with our dual controlled patented Innercoil air chambers. More than 30 years have gone into perfecting their manufacturing process; the result is 19% stronger using lap seam construction, a breaking strength 25% stronger and elongation 73% stronger than others. Made from the strongest materials available, the patented Innercoil system responds to body weight and natural curves for healthful support and comfort. Perfect-Fit Contour Rails are curved to fit perfectly around the edges of the air chambers transitioning smoothly to the edges of the mattress, while keeping your mattress straight and true. Somma Aire Sleep systems enhance air's natural advantages, cradle and support the contours of your body, and respond to your every move. Features Coils for Midbody Support. Somma Aire Sleep Systems have been Certified by the American Sleep Research Institute (ASRI) for superior sleep performance. 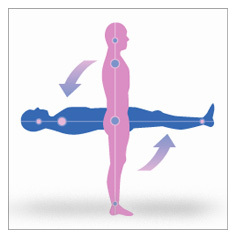 Stand-Tall Sleep-Tall Body Alignment and Tri-Zone Support System encourage correct postural alignment with resilient mid-body support. Technologically advanced Smart and Quiet pump is a computerized air compressor which adjusts to different weights and body types. Operating at below ambient bedroom noise levels, the Smart System features a solid state LED digital readout and programmable memory to save your favorite comfort settings; similar to that in luxury automobile seats, thereby eliminating the guesswork when changing settings. Originally developed for critical military applications, the computerized pressure transducers (one for each side) are calibrated and laser trimmed for accuracy and linearity. Linear compressor technology results in better performance, less problems and longer life. The pressure targets at each numeric setting on the Smart System are on a curve to match human perception of pressure. Unlike many digital read-outs on the market which do not measure the true air pressure in the air chambers, the Somma Aire's, " Smart and Quiet" system displays an accurate measure of firmness level at all times. This (ASRI) Seal of Approval Certifies that this product was tested and approved by the American Sleep Research Institutefor superior sleep performance. Warranty: 20-year Limited More about the warranty. 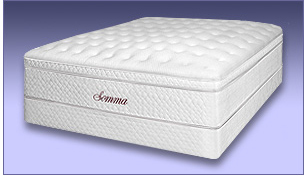 Note: Somma Aire Beds are manufactured by Land and Sky and exclusively distributed by Sleep Pros. Land and Sky has an international reputation as a major manufacturer of air and water beds and holds over 40 patents.